When you see the four visually alike family of spices that is cumin seeds, caraway seeds, black cumin (also known as Nigella seeds) and fennel seeds do you ever wonder if they are the same but just come in different colours and size? These tiny little seedy cousins are in effect far from being related yet easily confused by many. In my early culinary venture into the kitchen, I too was unsure of them. I was convinced that they were an exotic species of cumin seeds that came in different colours, just like the colour variants of Green and Black Cardamon. However, one wrong buy of Caraway seeds mistaken to be cumin seeds clarified it all! It tasted absolutely different and surely was not the right fit of most Indian dishes I wanted to make. And hence started my spice trail!! In this post I will touch upon the two closest resembling spices that are caraway seeds and cumin seeds. They make look like siblings but are actually not even of the same lineage! It is this very subtle difference in its colour and appearance that makes them the most commonly confused spice. Will go through a DNA classification with other cumin species in the coming weeks, but for now here is the difference between the body doubles! Where do Caraway Seeds and Cumin Seeds Come from? Both Cumin seed and Caraway seed appear to be visual twins with a slight difference in its colour or shape. Well, in Switzerland, non-German or French speakers fall prey to this as they assume caraway to be the German/French word for cumin. I know I know no one said life was easy … so why should choosing a tiny spice be?!! What hit home was when I did a google translate to Hindi and realised that the Indian name for caraway seeds is called ‘Shahi Jeera’. I was aware of Shahi Jeera as one of those mysterious spices used to make special dishes that add an earthy Royal touch of flavour to the dish. Cumin seeds are the dried seeds of the herb plant known as Cuminum Cyminum. Nearly a third of the world’s supply of Caraway seeds comes from Finland where they are mostly grown. So the source of origin of the two is the first indication that these two doubles are indeed not related and born to different families. Are Caraway and Cumin Seeds different in appearance? The reason why I picked up the wrong kind of seeds is not only because of the similarity of its name but also their similar looks. Caraway seed is darker in colour when compared to cumin seeds. It has dark and light brown zebra type stripes on its skin and is smoother to touch. The shape of a caraway seed also tends to be slightly curved and bendy. They can be smaller in size to cumin seeds as well. However, the difference in size is not always guaranteed. Cumin seeds are light brown in colour and have relatively a rougher surface. The colour is more even without the darker stripes. It does not have the curves like caraway seeds and are more linear in shape. So in body shape type one is curvy while the other is oblong!! If I was to go with stories about the initial culinary uses of Cumin seeds then it can be traced back to the Mediterranean and Iranian regions. Cumin seeds are increasingly popular in Latin American, African and Middle Eastern cuisines. It is impossible to think about Indian cuisine without cumin seeds. Its one of the most essential Indian spices which form the basis of many Indian curries, dishes and spice blends including Garam Masala. 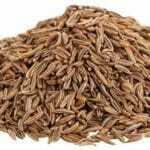 Cumin seeds can be used both in powder and whole seed form for making meats, rice and many vegetarian dishes both Indian and international. Crushed whole seeds are also added to breads, cheese, biscuits and to make other baked goods to give them the cumin flavoured taste. Caraway seeds, on the other hand, is popularly used in Central and Eastern European cuisine particularly Germany, Finland, Sweden, Poland and Hungary. However, its use has overflowed to other cuisines as well. It is one of the main ingredients used for making Rye and Soda Bread. It is also used to cook curries, sauces, flavouring and even as a pickling spice. How Does Caraway powder and Curry Powder Taste? Even though the two look similar, their flavour is very different. While caraway seeds have a strong aromatic flavour, the flavour of cumin seeds is milder. The taste of Caraway seeds is something akin to liquorice and it’s more nutty and earthy compared to cumin seeds. The taste tends to be a bit sharp and to some extent slightly pungent. Cumin seeds fall under the sweet category of spices and are mellow in its taste when cooked or eaten raw. As the flavour of cumin seeds is not overriding, it makes a great base spice for many spice mixes, sauces and curries. Can you use Caram seeds Instead of Cumin seeds or Vice Versa? We know by now that the flavour and taste of caraway seeds and cumin seeds are both different which means they really cannot be used as substitutes for each other. If however the recipe calls for caraway seeds and you do not have any then your closest and best match for it is using fennel seeds, anise or even star anise. All the above spices broadly belong to the liquorice family and have similar taste and flavour and can, therefore, be easily substituted with the other. Since cumin seeds are more of a flavouring spice used for tempering dishes or add flavour to baked goods you can choose to omit it from the dish if you wish to. Or the closest substitute for cumin seeds is to use cumin powder or coriander powder. Using cumin seeds to replace caraway seeds is also a common practice, but it should be borne in mind that the flavours of the two are different and will result giving the dish a different taste, which is not that unappetising! Where to Buy Spices From? Both these spices are readily available in most large supermarkets these days. Although you may find Cumin seeds to be the more popular of the two when it comes to shelf stocking. Your Local Indian store or ethnic store will surely have these. When it comes to buying and using caraway seeds and cumin seeds it’s important to remember that both have different flavour and taste. Since they look very similar to each other, pay attention to the package and the colour of the seeds when buying. Although not the best substitute for each other, it will not kill your dish if you do happen to replace one with the other. 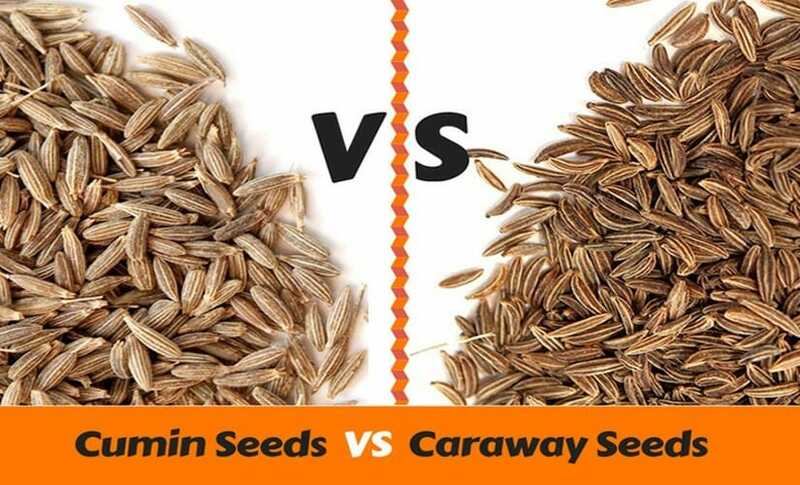 Have you ever got confused between caraway and cumin seeds and bought or used one for the other? Let me know if there are any other spices you get mixed up on. Will write something up for sure!